The Beatles' Sgt. 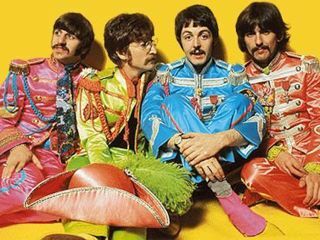 Pepper's Lonely Hearts Club Band - has there ever been an album so acclaimed and analyzed in music history? MusicRadar has located two breathtaking YouTube clips in which you can hear the real genius of The Beatles at work. In the first clip, we have the isolated bass & drum tracks to A Day In The Life. There is a brief acoustic guitar intro played by John Lennon, which leads into pure nirvana: the naked takes of Paul McCartney playing bass and Ringo Starr on drums. Paul's bass parts are pure, simple melodic genius. And as for Ringo, his performance is masterful and downright orchestral in nature. After years of trying to discern his complex tom and floor tom combinations, here they are to savor - and memorize. And check out Lennon's vocals bleeding through the drum mics - haunting. And if you want to hear the lead vocals in isolation? Well, here they are too. Listen out for the count through the middle section where the orchestral crescendo would be added later. Next we have another thrilling clip - the lead and backing vocal tracks of the title cut. If there was any doubt (and why would there be? ), of the Beatles' stunning abilities as singers, it all ends here. Paul McCartney absolutely rips it up. And the harmonies...well, listen for yourself. Can it ever be topped? Hard to say.